U.S. analysts have said that North Korea's nuclear program has quickly accelerated and the country is now making missile-ready nuclear weapons. 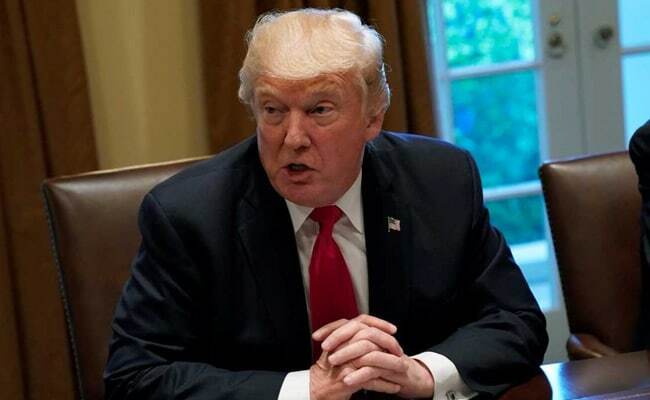 President Donald Trump continued to make vague threats toward North Korea on Saturday, saying that diplomatic negotiations and agreements over the years have not worked and that "only one thing will work," without elaborating on what that one thing would be. "Presidents and their administrations have been talking to North Korea for 25 years, agreements made and massive amounts of money paid . . . hasn't worked, agreements violated before the ink was dry, makings fools of U.S. negotiators. Sorry, but only one thing will work!" Trump tweeted in two messages on Saturday afternoon. North Korean officials have previously called some of Trump's comments and tweets declarations of war. U.S. analysts have said that North Korea's nuclear program has quickly accelerated and the country is now making missile-ready nuclear weapons. Last week, tensions again escalated as North Korea threatened to shoot down U.S. military planes, even if they are not in the country's airspace. The president's latest tweets come as the world continues to try to decipher another cryptic message that Trump issued on Thursday night at the White House, as he posed for a photo with the country's top military leaders. "You guys know what this represents?" Trump asked reporters in the room that night. "Maybe it's the calm before the storm." When pressed to explain what he meant, Trump said: "You'll find out." The White House has declined to explain what, if anything, the president meant with that comment. "We're never going to say in advance what the president's going to do," White House press secretary Sarah Huckabee Sanders said at the Friday news briefing. "You'll have to wait and see." As Trump left the White House on Saturday evening, reporters again asked him what the comment meant. "Nothing to clarify," the president said. When pressed again on what he meant, Trump said: "Well, you'll figure that out pretty soon." Trump also said that he has "a very good relationship" with Secretary of State Rex Tillerson, despite a report from NBC News this week that Tillerson has been deeply frustrated with the president and even referred to him a "moron" after a meeting at the Pentagon in late July. Trump doesn't believe that report, which was sourced to three officials, and again called it "fake news" on Saturday. "We have a very good relationship," Trump said of Tillerson on Saturday. "We disagree on a couple of things. Sometimes I'd like him to be a little bit tougher, but, other than that, we have a very good relationship."